If you already use Oxygen apps for Office 365 and SharePoint, then you already know how user friendly and powerful our solutions are – sleep easy in the knowledge you have chosen the most human-centric and fully managed SharePoint solution available today and proudly exclaim that you know just how easy filing documents and emails to and from SharePoint apps can be. If, however, you are thinking about making this your next move, either to the Oxygen suite of apps, or simply to Office 365 and SharePoint online then you really need to make Oxygen for Outlook, powered by harmon.ie part of your plan. Oxygen for Outlook is the way to connect Outlook – and let’s face it, Outlook is the most widely used email client globally – to your Office 365 and SharePoint apps, sites and lists. By first understanding our customers and user’s actual day to day needs, we realised that not everyone wants to have to use ‘another’ piece of latest, greatest technology – thankfully, Oxygen is not just another app. At ISAAC, we believe in creating solutions that engage every member of your team, regardless of generation. We give our users multiple ways in which to interact with their single, centralised source of data; able to share docs and file emails rapidly, intelligently (it adds the same metadata as your Oxygen app, meaning finding docs is simple) via Web, mobile or directly from within Outlook. Upload documents, email attachments, and email messages to your Oxygen apps or directly to Office 365 and SharePoint sites, and OneDrive for Business. 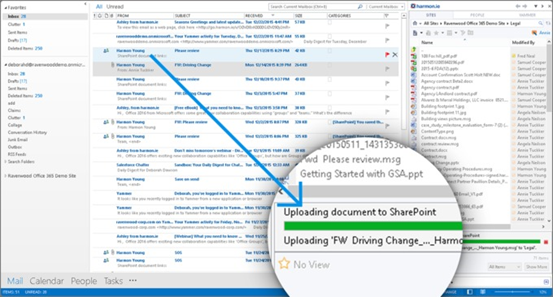 Full-featured support for SharePoint means users can accurately categorize documents and emails. When combined with any one of our Oxygen apps, users are prompted to supply required metadata before checking in documents and emails – never lose another filed document or email again! Automatically capture email messages together with important documents in one central Oxygen document library, including Intranet, CRM, or even HelpDesk. Map metadata and file directly into designated libraries. Never lose a document or email again. View documents and emails stored in Oxygen apps in SharePoint Online and Office 365 directly from the Outlook or Notes window, without having to download them first. It has never been easier to quickly locate content, especially when stored in big files. Focus on important business tasks by seeing relevant information from all your apps, presented by topics, the way the brain works. Eliminate Document Chaos – Sharing links instead of attachments (just like you would from directly within your Oxygen app) means everyone is working on the same version of a document or email draft. Sharing document links rather than email attachments substantially reduces email storage. Automatically view who last modified a document or email, then connect using Skype for Business or Yammer. With built-in presence awareness, you can even see who is online. Everything from a single app directly within your Outlook. Automatically setting the search scope directly in the Oxygen for Outlook window speeds search for content in large Office 365 and SharePoint layouts.